Fairly often now, I get e-mails from out-of-town readers of Lost City who are planning on visiting NYC and want to know what classic Gotham spots they should visit. Aside from the Empire State and Grand Central and the other hugely obvious destinations, I mean. So, rather than continuing to answer these queries piecemeal (though I'll continue to do that if people ask), I've decided to tackle the matter neighborhood by neighborhood, starting with this item on Times Square. I figure, anything that helps these old businesses stay afloat is for the good, so might as well direct as much traffic thataway as possible. I'm starting with Times Square for a few reasons. One, it's where every tourist ends up eventually, so a guide to it will be of the most use. Two, there's precious little of Old New York left there, and, as I'm freaking lazy, it will be an easy thing to write up. Also, keep in mind: this is not meant to be an ideal of complete-ism. It's a smattering, a selection, a best-of. Also, I'm focusing on things that are still there; not "This is where this was," or "On this spot once stood." Living history, not dead history. 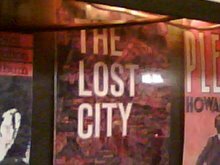 Contrary to some ideas people have of this blog, Lost City is not about nostalgia (not entirely, anyway); it's about old, but living and breathing places that ought to be celebrated and preserved. BROADWAY THEATRES: Even if you don't like theatre, go to a Broadway show. This collection of 30-odd old theatres has no architectural equivalent in the United States. They are gorgeous buildings, inside and out. The New Amsterdam's interior has the most opulent glitz for your buck (Don't miss the former gentlemen's lounge downstairs, with its murals and circular bar). The Hirschfeld is exotic, the Booth intimate and the Shubert's a beaut. And if you're really looking for the oldest everything, go to the ornate Lyceum, built in 1903 and the oldest continually operating Broadway theatre. AMC EMPIRE 25 CINEPLEX: This 42nd Street movie house used to be the Eltinge Theatre, named after Julian Eltinge, the greatest female impersonator of the early 20th Century. The old ceiling murals are still there. THE NEW YORK TIMES BUILDING: This grand structure on 43rd Street is where the paper did business for most of the 20th century. A great building no matter who occupies it next. THE PARAMOUNT BUILDING: An Art Deco gem on 7th Avenue and 43rd, and one of the oldest surviving buildings in an area now littered with colorless glass boxes. Frank Sinatra wowed them here. The mountain-like structure has a beautiful, illuminated, four-sided clock which chimes "Give My Regards to Broadway" every night at 7:45. Take a tour of the lovely lobby for an idea of the vibrant life that office building lobbies could once generate. THE FORMER KNICKERBOCKER HOTEL: This 16-story Beaux-Arts building at the corner of Broadway and 42nd Street was the place to stay in the early 20th century. Caruso sang from the balcony to the crowds below. It's also the only building at the Crossroads of the World that still looks like the Times Square of old. FRANKIE & JOHNNIE'S STEAKHOUSE: But hurry! This second-story former Speakeasy on W. 46th Street will shut down for good at the end of January. As far as I know, it's the second oldest restaurant in the area. SARDI'S: This is the oldest. I know: it's cliche, it's musty, it's old hat. It's also history and splendid and romantic and you'll be treated well and get some decent food. You won't see any theatre stars; but plenty of past celebrities are in frames on the walls. 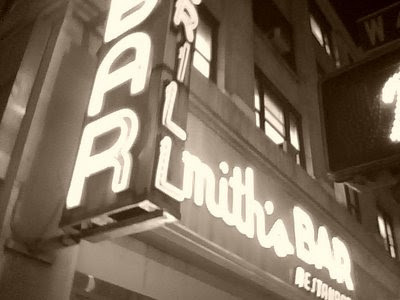 SMITH'S BAR AND GRILL: A bar, a grill and a sign to remind you of the Times Square of the 1950s. Nothing too special inside. And nothing too fancy. Which makes it great. CAFE EDISON: An affordable and classic diner inside the Edison Hotel on 47th Street. A popular theatre hangout for stage pros who are more interested in eating than being seen. Try the matzo ball soup. The Rum House, a bar next door that is also part of the hotel, is worth a look too. 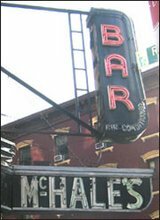 JIMMY'S CORNER: The best bar in Times Square, and the last saloon that speaks of the area's rich past. It's a shotgun space owned by Jimmy Glenn, a former boxing trainer, and full of easy-going charm, good music, cheap beer and waitresses in short skirts. NOTE: I've limited this survey to the area above 42nd between Eighth and Sixth Avenues. Attractions to the south, west and east will be covered in future entries on Hell's Kitchen, Midtown and the Garment District. You are right about Jimmy's Corner, of course, but I must demur on the subject of Smith's. It has been gentrified almost beyond recognition. Okay, so it's still a little plain inside, and has the great neon sign. Well, it just ain't the same. Oh, sure, it's nicer now. Does the Edison Coffee Shop fit in here? It's the only old time restaurant I look forward to visiting in Times Square. Great blintzes. thanks for the jimmys corner tip. new one on me! I've added the Edison, Carol. I knew I'd forget something. Wilfred: Had no idea about the Smith's more colorful past. Thanks for this guide, Brooks. It's excellent, and also so useful at a time when all of these kinds of places are disappearing. Jimmy's Corner is one of my favorite spots, too, and I love their jukebox. Another place I love, that may be one of the least hip places in the city, is the Rum House on 47th Street. It's part of the Edison Hotel, and has a pleasingly funky nautical motif on the inside. Once I heard some patrons ask about the pizza on the menu, and the waitress explained to them that it wasn't very good, being frozen, but that they (the customers) would be welcome to get some pizza at the pizzeria around the corner, and come back to the Rum House to eat it. It's that kind of looseness - a lax attitude when it comes to management regulations - that I often miss most about NYC in 2009. Lost City Asks "Who Goes to Le Veau d'Or"? A Velvet Revolution at "21"? Matchbooks of the Lost City: Who Went There?